It was has become the shining gem on not only the concert scene in New York City but probably in all of the United States, the brand spanking new Barclays Center in Brooklyn will heat up this summer with some of the biggest names in the music business today taking the concert stage. The new home of the Brooklyn Nets opened back on September 28, 2012 with a concert by Bed Stuy’s own Jay-Z. Since it has opened, the following major names have played the venue: Barbra Streisand; Andrea Bocelli; The Rolling Stones; Mumford & Sons; Coldplay; Swedish House Mafia; Dave Matthews Band and Green Day among others. This summer, the following bands and artists will come through Brooklyn and play Barclays Center: Rihanna on May 4 and May 5; The Killers on May 18; Paul McCartney on June 8 and June 10; Bruno Mars on June 29; Justin Bieber on August 2; Beyonce on August 3 through August 5; Fall Out Boy on September 7 and Atoms for Peace on September 27. Tickets for all concerts at the Barclays Center this summer can be found right here at SeatGeek. 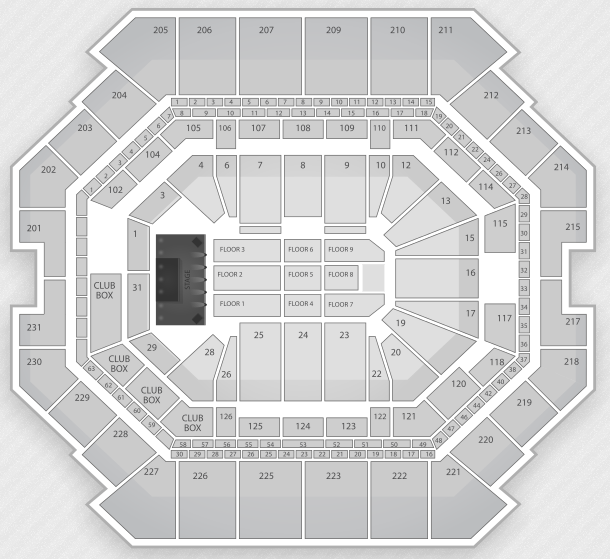 For a look at the seating chart for concerts at Barclays Center, check out the image below. The venue seats 19,000 for concerts.